If you happen to know of a state motto or a city moniker that we haven’t included in the resource, please get in touch. Your contribution will be greatly appreciated. Motto: designed to enhance the city’s cultural, historical, economical or social importance. Moniker: synonymous with a city, usually used alongside the actual city name. Nickname: a familiar, invented name used instead of the actual city name. Slogan: a brief sentence or a phrase used to identify the city. Tagline: a variant of a branding slogan typically used in marketing materials. 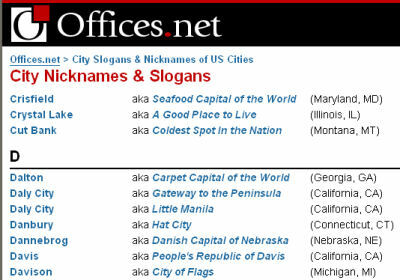 This entry was posted on Thursday, March 18th, 2010 at 11:09 am	and is filed under Cities & States. You can follow any responses to this entry through the RSS 2.0 feed. You can leave a response, or trackback from your own site.